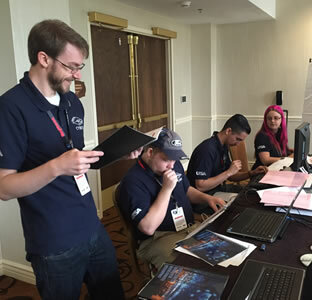 UTSA Collegiate Cyber Defense Competition team members defend their operating network at the national competition held over the weekend at the San Antonio Marriott Riverwalk. (April 27, 2015) -- Members of the "Blue Team" from the University of Central Florida were crowned champions for the second year in a row at the 2015 National Collegiate Cyber Defense Competition, held in partnership with Raytheon. The win at the finals in San Antonio earned them more than bragging rights: Raytheon offered an internship to each student on the team and will bring them to Washington D.C. later this summer to tour some of the nation’s top research and national security cyber sites. After winning last year’s championship, the team members didn’t spend the flight home to Orlando celebrating, said coach Tom Nedorost; instead, they compared notes on how not to make the same mistakes in this year’s competition. “They became a very tight-knit cohesive group, some taking the same courses together and others even rooming together,” Nedorost said. “When you get that close, you quickly learn your teammates’ strengths and weaknesses. During this year's championship, they were finishing each other's sentences. Sometimes they didn't even have to speak to act, like they were reading each other's minds." According to Nedorost, practice made perfect, calling it one of the keys to their victory. The team trained three days a week, four hours at a time, during the entire spring semester. While each of the eight students specialized in different cyber disciplines, the team studied each other's specialties so they could back each other up in a crisis. UCF beat the second-place Bears of the University of California, Berkeley, and bested the third-place Tigers of the Rochester Institute of Technology, New York. About 200 teams from universities and colleges across the United States competed in 10 regional events to determine who would go to the April 24-26 finals in San Antonio. The regional winners were: At-Large Regional: University of Alaska Fairbanks; Mid-Atlantic Regional: University of Maryland, Baltimore County; Midwest Regional: DePaul University; Northeast Regional: Rochester Institute of Technology; North Central Regional: University of Nebraska at Kearney; Pacific Rim Regional: ITT Tech Boise; Rocky Mountain Regional: Southern Utah University; Southeast Regional: University of Central Florida; Southwest Regional: The University of Texas at San Antonio; Western Regional: University of California, Berkeley. During the finals, each team acted as the information technology department for a small business, such as an online pharmacy, retailer or other net-dependent company. They attempted to keep their businesses running while fending off cyber-attacks from a team of 20 penetration professionals and white hat hackers — the so-called "red team." During this year's scenario, teams simulated operating an electric utility company while the "Red Team" tried to hack into their network. We had to keep the network secure while taking customer complaints about power outages," Nedorost said. "I found the scenario extremely realistic, except we crammed about a month's worth of IT work into 48 hours. In the end, I am extremely proud of our team. We have five students graduating this year who will move on to very successful careers. "I think we'll spend this year's flight home celebrating," Nedorost added. "We won't start planning for the 2016 competition until next week." The competition is in its 10th year, and Raytheon has signed on as a sponsor through at least 2016. The sponsorship is a big win for both the competition and the Waltham, Mass.-based defense company. Raytheon counts cyber defense as a core capability and has become an industry leader in information assurance. "The students that compete at the National Collegiate Cyber Defense Competition are the next wave of cyber experts...these are people who will guard our critical cyber infrastructure against sophisticated threats,” said Dave Wajsgras, president of Raytheon Intelligence, Information and Services. For more information about the National Collegiate Cyber Defense Competition, visit NCCDC or connect with us on Twitter (@nationalccdc) and Facebook (facebook.com/nationalccdc). Raytheon Company, with 2014 sales of $23 billion and 61,000 employees worldwide, is a technology and innovation leader specializing in defense security and civil markets throughout the world. With a history of innovation spanning 93 years, Raytheon provides state-of-the-art electronics, mission systems integration and other capabilities in the areas of sensing; effects; and command, control, communications and intelligence systems, as well as cyber security and a broad range of mission support services. Raytheon is headquartered in Waltham, Mass. For more about Raytheon, visit us at www.raytheon.com and follow us on Twitter@raytheon.